I offer a very heartfelt THANK YOU to TUTTACRONACA. Cheers! 1. I wanted to be a meteorologist or more importantly, a storm chaser. 2. I played quad drums in marching band in high school. 3. J.R.R. Tolkien and Jane Austen share the tied spot as my favorite authors (Mark Twain is a close second though). 4. Collectively, I have two dogs (Wolvsly and Penelope) and a cat, who acts more like a dog (Sambuca). 5. I have red hair. 6. I’m an evolving geeky girl that’s still growing up. 1. Copy the award and place in your post. 4. 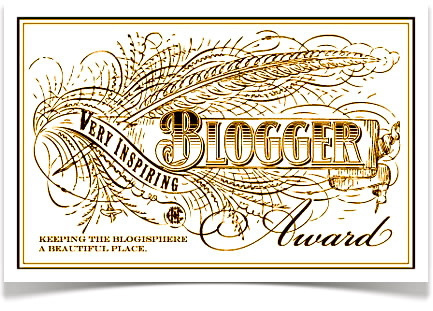 Nominate 15 fellow bloggers for the award, tell them by posting a comment on their blogs. Hey! Words of Birds here – thank you, a million times, thank you! I can’t tell you enough how big of an honor it is to be featured here as your number 1. I’ll make sure to post something good today just for you. Don’t hate me, I have written a work in honor of your compliments and I will post it soon, I’m just…uh…building anticipation! Wow. Thanks so much. I am honored to be acknowledged in such a great list of bloggers. And congrats to you as well. Have an amazing year! Cheers.